Carnage: The aftermath of a fire at a Deepwater property. DAYS of bushfires burning in coastal areas across Central Queensland have destroyed homes, torn through thousands of hectares of bush and farmland, and forced more than 1500 residents to evacuate. However, amid heatwave conditions, the loss and worry, the spirit and deeds of smoky-faced volunteers has inspired entire communities. “The whole community is pulling together with this disaster,” Agnes Water Catholic parishioner Sue Davies said. Halfway between Gladstone and Bundaberg, exhausted local fire crews bolstered by teams from across Queensland and interstate battled out-of-control fires fuelled by dry conditions and fanned by unpredictable winds. As well as an army of volunteers on the ground, a huge water-bombing plane dumped 15,000 litres at a time on the fire front, alongside seven other aircraft. 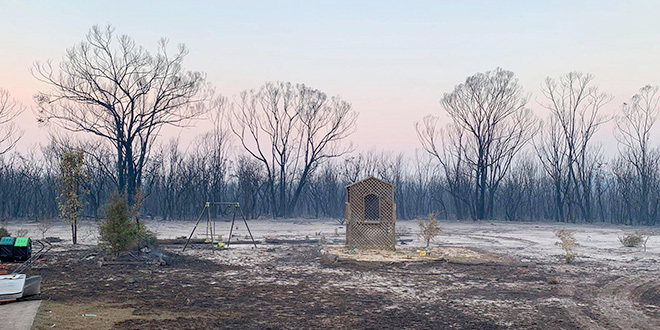 At one point the massive fire ripped through national parkland and a “Leave Now” notice was issued to about 800 residents around Baffle Creek and Deepwater. An evacuation centre was set up at Miriam Vale Community Centre and residents were advised to go there if unable to lodge with family or friends. As the fires spread, so did the generous spirit of locals, including offers of free accommodation, food and water, and even refuge for livestock. Hotels and motels opened their doors, a butcher donated a box full of bacon and sausages, the local café supplied coffees to keep the crews going, and local school children pitched in making sandwiches and chopping watermelon. Seeing the need, a baker in Gladstone offered 50 loaves of bread. “Is anyone able to collect them (the loaves) or heading down to Agnes Water from Gladstone in the morning?” the baker posted on Facebook. “Proud to live in a community that pulls together in times of need, the love and support that I have observed and been a part the past few days fills my soul with gratitude,” posted Tracy Bocos Lowe, a family counsellor. “Thank you to everyone in our sister community who have taken some of us in from the Deepwater area after we evacuated Sunday,” posted Leah Jett Chynoweth-Tidy.